Improving transport infrastructure in the North West would help the most in making the region a better place to do business, according to the findings of the inaugural EY Regional Response. The poll questioned Insider readers on what they felt would bring the most benefits, with 42.6 per cent saying greater investment in transport infrastructure would provide the biggest boost. In second place was offering better business support initiatives (19.7 per cent), greater investment in skills was third (14.8 per cent) while 11.5 per cent thought sector-focused business hubs could help the most. Closer working relationship between the public and private sector polled 6.6 per cent and greater support for exports was at 4.9 per cent. The majority of respondents said extending the planned HS2 rail network to Liverpool could be vital in ensuring the region remains an attractive place to do business. Currently, the proposed HS2 route – known as the ‘Y’ extension which will branch off from Birmingham to the North West and Yorkshire – does not go through Liverpool. Instead the city would be joined up with the high-speed line via a connection from the West Coast Mainline at Crewe. But the 20 Miles More campaign, established by a group of business leaders, has claimed an extension of the HS2 line could generate £8bn for the Liverpool city region’s economy over the next 20 years. 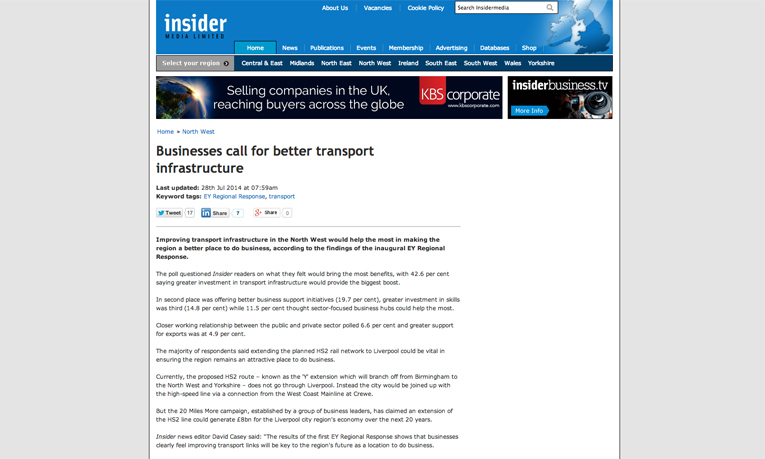 Insider news editor David Casey said: “The results of the first EY Regional Response shows that businesses clearly feel improving transport links will be key to the region’s future as a location to do business. “Schemes such as the £600m Northern Hub, which will improve rail links across the north, are vital but companies need investments like this to happen faster. Earlier this year, North West Business Insider launched a campaign to call for the delivery of HS2 to be brought forward, backed by ten high-profile business including Manchester City Council chief executive Sir Howard Bernstein and Liverpool mayor Joe Anderson.